Emmanuel Macron has big plans for Europe. In order overcome the current crisis, he wants more community, more solidarity and more investment. And Germany is worried that it will have to foot the bill. The original New Deal can be traced back to Democratic US President Franklin D. Roosevelt. In the 1930s, during a severe economic crisis, Roosevelt fought unemployment and stabilized America΄s spiraling financial and political situation in part by undertaking an enormous investment program and extensive social and economic reforms. The attempt to find a cure to society΄s ills in political extremism existed even back then. The current situation is hardly comparable to things at that time. And yet, France has been stuck in a long-term crisis: unemployment levels are, for example, twice as high as in Germany. France is falling behind in terms of international competition. Its levels of growth have been low for years, although they have recently picked up a bit. And finally, France has, for the last decade, failed to meet the European deficit criteria, while Germany has been generating surpluses. What this means politically, is that in the first round of the presidential election, almost half of the French constituency voted for candidates who had goals that supported globalization but were critical of the EU. 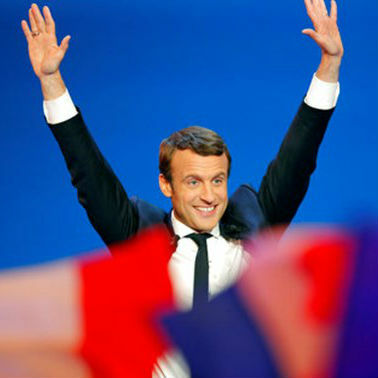 Many of the second round votes were not for the eventual winner, centrist Emmanuel Macron, but rather, against the right-winger Marine Le Pen. Macron now wants to reduce corporate taxes and the ratio of government expenditures to gross national product. He also wants to liberalize the labor market. This has nothing to do with a New Deal. He will be tackling this as his second major project, which is an investment program for the whole of the Eurozone. This should be financed out of the EU΄s collective budget. Schauble insist on regulations The term "New Deal for Europe" was mentioned during Macron΄s visit to Germany in March, only weeks before the election. But what Macron has in mind, he already set out in a paper two years ago as economics ministers, together with his then-counterpart, Social Democrat and current German foreign minister, Sigmar Gabriel. This includes strengthening the Eurozone through a common budget, as well as introducing "new executive powers" in the euro region, a "Euro chamber" and a "Euro commissioner." The goal is to create economic and social unity. Macron has repeatedly brought into play the idea of introducing common bond issues for the European states, with joint liability. But for the conservative faction in Berlin΄s Grand Coalition, this is going too far. Combined budget and joint debts sounds to these Christian Democrat (CDU) politicians too much like shifting the responsibility from France to the German taxpayer. Chancellor Angela Merkel immediately reacted coolly: "German support cannot, of course, replace French politics." She rejected the idea of Eurobonds. Finance Minister Wolfgang Schauble, is indeed behind strengthening the Eurozone. But for him it is more about enforcing the lacking budgetary discipline. In an interview in the Italian newspaper, "La Repubblica" he said, with a view to France. "It is a simple concept: If we create rules, then we also have to apply them." He also recently said, at the Viadrina European University in Frankfurt Oder, "France is so big and strong that it doesn΄t consider foreign help to be necessary." In other words, yes to providing support, as long as it does not cost anything. Fear of Le Pen used as leverage There is divided opinion between politicians and political commentators. Some accuse the federal government of being stingy, which they will later come to regret, while others see Macron΄s plan as a brazen redistribution of costs, at Germany΄s expense. According to Gregory Claes, from the Brussels think tank Bruegel, for tactical reasons Macron will at least comply with doing things in the right order. "He should firstly concentrate on internal reforms in France and try to show that he wants to conform with stability regulations," Claes said. "This will win him back credibility with Germany and other northern European countries." He will hardly dare to come forward with European reform ideas before the German federal election. On the other hand, Berlin-based political scientist Ulrike Guerot believes that Macron has political leverage over Germany. "He can hold Great Britain up as an example," he told news agency DPA. "Germany has a lot to lose when one country goes haywire. Macron could say: ΄If you don΄t help me you will have to deal with Marine Le Pen next time.΄" But blackmailing could also backfire. Especially now, during the German national election campaign, EU skeptics could get a fresh boost if the German federal government gives the impression of being under pressure from France. Many believe that, politically, there is much more at stake than economics. The New Deal in the US helped democracy prevail, despite the severe economic crisis. In Germany and other countries, things were different. Elmar Brok, a European Parliamentarian for the CDU who has been following the development of the EU over several decades, says: "Europe is falling apart. Emmanuel Macron is the last chance. We have to do something." Opinions on what needs to be done, however, differ greatly.